The screen around the cenotaph in the Taj Mahal, Agra. bl.uk > Online Gallery Home	> Online exhibitions	> Asia, Pacific and Africa Collections	> The screen around the cenotaph in the Taj Mahal, Agra. 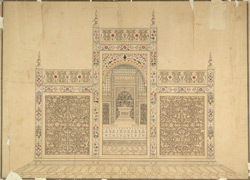 Watercolour of the screen round the cenotaphs in the Taj Mahal, Agra, Uttar Pradesh, by a Delhi or Agra artist, c.1830. The Taj Mahal was built by the Emperor Shah Jahan (r.1628-58) in memory of his favourite wife Arjumand Banu Begum, titled Mumtaz Mahal, upon her death in 1631. Constructed of India’s finest marble, quarried at Makrana near Jodhpur, it took 12 years to build involving 20,000 craftsmen from all over Asia. The tomb and accompanying buildings are organised around a garden divided into four parts by raised walkways with water channels at their centres. The domed white marble mausoleum stands on a plinth with tapering minarets on each corner. There is a high recessed arch or 'pishtaq' at the centre of each of the building's four facades; each central niche is flanked by further small double arches. Inlaid coloured marbles and gemstones in floral designs embellish the exterior and interior of the building. Its harmonious proportions and the high quality of its craftsmanship have made the Taj Mahal one of the most famous buildings in the world. The octaongal screen shown here surrounds the cenotaphs of Shah Jahan, who is also buried here, and his queen. It is constucted from slabs of carved marble which are then carved to create pierced panels in floral designs. Its surfaces are inlaid with gemstones, including carnelian, tigers eye, lapis lazuli and agate, to create representations of flowers found growing naturally in the local area; these include lilies, lotuses and poppies.